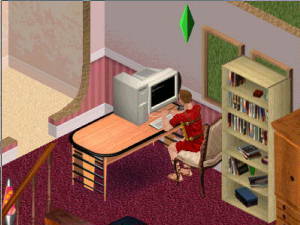 Pic of the day: Not a photo, but a screenshot from The Sims. Isn't that funny, a picture from a computer game showing a fellow with a computer? Sleep was quite necessary but not too comfortable. I did wake up gasping for breath. Then again, some people have it that way all the time. I eventually got out of bed, and went to read the Bible a little while. Yes, it was that bad. Ahem. But anyway, that was not the only exciting thing to happen today. I also played computer games! For example The Sims as you may guess. There is something encouraging in the sight and sound of kids at play, even electronic ones. Well, perhaps mostly electronic ones. I guess I'd quickly become fed up if I had physical kids running rings around the house. Hard to say, really, I don't see much kids these days. Used to be that there were lots of them, and generally we got along well. OK, enough of that. Maxis is making an add-on to The Sims, supposed to be called Living Large. It will not just give more wallpapers and stuff, but also new venues of gameplay. A crystal ball will not just let your characters see the future, but more importantly change it. A lamp with genie seems to have the power to randomize relationships. (As if those rabbits needed that. Don't get me started on the main selling point of the add-on, a realistically vibrating heart-shaped bed.) And the occasional UFO abduction could severely randomize your characters' personality. But best of all, there will be new careers, including hacker. I really really hope the hackers will be able to work from home. One surprising lack of realism in The Sims is the de-powering of the computer. Basically you can do two things with a computer. Play and look for a job (if you're adult) or play and study for school (if you're a child). That's it. The play value depends on the price of the computer, fair enough. But what about the rest? For instance, you can't get any social points from a computer. You have to actually invite people over. (The phone is also used only to invite people or get hired help. Have these people never chatted away an hour on the phone with a friend or a loved one?) For added realism, you should be able to get a moderate influx of social points from both phone and computer (think e-mail, chat, IM). A slightly reclusive person may subsist almost entirely on this. And what's with not being able to work from home with your computer? OK, most of us don't, but there are actually tens of millions of people who do. And there are more and more of them. Even my first PC game back in the 80es, Jones in the fast lane, let people earn money with their PCs. (Though you need not send me bulk email offers, people. I get enough of those as is.) Finally, I think the computer should be as good as a book to learn cooking and repair. Think learn2.com and such. I'm too lazy to learn useful stuff myself, but it's out there. But wait! The excitement does not stop here! No, I also took two walks. In real life! Outdoors! Yes, and I have the photos to prove it. If I live on and remain functional, I intend to post a few of those during the next few days, because they were just pretty. And the real thing was even better. Early in the day (morning may be an overstatement), it was pretty cool in the living room, not to say chilly. (Though it helps to sit close to the portable while playing The Sims. Ahem. It actually heats up the computer rather fast.) Anyway, I put on warm clothes and went for a walk. And found that it was quite a bit warmer outdoors than indoors. My living room is on the west side, so it had retained the chill of the night, while the sun was beaming outside. 20:30 (8:30) in the evening, the opposite happened. It was fairly hot inside, so I put on the lightest clothes I could find and still be decent, and went for a walk. Now of course it was chilly outside. Not so that I was freezing, not after the first uphill slope at least. But comfortably cool.